Wing Chun Kung Fu is a close range form of kung fu and is a much more linear fighting system as opposed to some of the “animal form” Kung Fu styles (Tiger style, white crane etc). 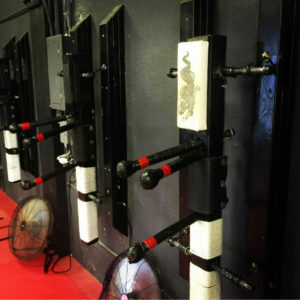 Wing Chun is excellent at close range fighting, commonly called “infighting range“, it uses short range punches, elbow strikes and trapping techniques. Martial skills at infighting range will give you a significant advantage Because most martial arts systems don’t utilize that close range. 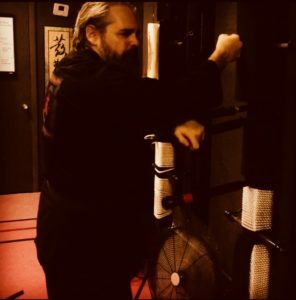 The only other styles besides Wing Chun that are familiar with infighting range are systems such as Muy Thai, Filipino martial arts systems like Kali, Jeet Kune Do, Krav Maga and lesser known systems like Penjak Silat and Kuntao. Most other systems have limited skills at this range if any. Because this range is relatively unknown you will have significant advantages against an attacker with the skills. These close range kung fu skills emphasize “trapping“. Trapping is a temporary immobilization of the opponent’s arms. This allows you to stop the opponent from striking you and also to impede their ability to defend and block your techniques. Trapping range relies of some simple techniques that are commonly used (Pak Sao, Lop Sao etc). Wing Tron also depends heavily on being able to feel, monitor and control the opponents power. Because the range is so close there is very limited time to see a strike coming and block it so close range systems depend on “reference points“ which are points of contact with the opponent that allow us to feel the attacks coming as the opponent is tensing to attack. Some of the martial arts techniques that are used in infighting range are also very powerful and will end a self-defense situation very quickly. For instance, elbow strikes and Knee Strikes are very fast, very hard to defend against and (even for smaller people) hit so hard that they tend to incapacitate an attacker. One usual aspect of closer range fighting is that it can favor the smaller fighter. Taller opponents can find it hard to move easily at closer ranges and fight effectively. Legend has it that Wing Chun was developed so that smaller Kung Fu practitioners could defend against taller attackers and many of Wing Chun’s most well known teachers were smaller men like Bruce Lee and Ip Man (Yip Man). We use the Wing Chun skills because they give us a significant self-defense advantage and make us more well rounded martial artists.